"For those of you new to this lifestyle I hope you find inspiration from me. Here I am this morning....closer to 60 yrs old than 50....used to be size 22, weighed well over 240 lbs. I was pre-diabetic, just a bleah existence. This is what a whole foods plant-based life can do. It wasn't easy at times, but I stuck to it, and now the WFPB life is second nature. I don't think twice about it anymore. It's my new normal. I set myself fitness challenges each year.....last year it was to walk a thousand miles. (Got there in October ). This year it's a CrossFit style challenge with yoga/flexibility goals thrown in too. Find your definition of happy and aim for it....you are worth it!!" This is Carol with 35-40 extra lbs. and today... She has no photos oh herself at 240 lbs. Wow, she does not look close to 60. What an inspiration, right! The photo on the left of is Carol at 35-40 lbs overweight. she doesn't have an official "before" photo at 240 lbs. because she hated having her photo taken and would rip any up that she saw! I have to say, she looks fabulous now. It's never too late to choose to be healthy. If you have a success story to tell, I'd love to hear from you, too. Tell me a little about yourself and where you’re from. CW: I was born and raised in England. I came to the US for my gap year and to cut a long story short, I never went back! Became US citizen in 1999. Telecom/IT Project/Program Manager – recently pushed into early retirement after a layoff and now I'm doing ad-hoc consulting, and working to make some of my other interests/hobbies become money-makers! Married, no kids, unless you count the 4-legged furry variety (3 cats!). Did you struggle with your weight early in life or did something change for you at some point? CW: I was a child of divorce and learned to use food for comfort and security when things around me were unpredictable. I was a heavy teen and got teased for it. And, I became fatter as a young adult. The worst I got to was Size 22/240 lbs+ (I stopped weighing myself after that, so I think I got a bit bigger). I absolutely hated having my photo taken and was known to rip them up whenever I saw them (just ask my husband)…. which creates a dilemma when sharing my success story with folks who don’t know me because I don’t have a “BEFORE” photo. Did you try other methods of losing weight and how did that work for you, if so? CW: Gloria Marshall figure salon. Jenny Craig. Weight Watchers. Atkins. My own forced diets (one of which resulted in a 106 lb weight loss, most of which eventually crept back on.) You name it I tried it. I’m a very disciplined person when I set my mind to something, but once the goal was reached and the diet was no longer needed I returned to my old habits. In my 30s I discovered triathlons and fell in love with them and got down to the 130’s in weight, size 8, was ripped, with 17% body fat. I blew out a knee doing a ½ Ironman and doc told me running days were over (no more pounding). Consequently, the weight battle returned. Knowing what I know now, this was not an effective solution. I may have been somewhat FIT but I certainly wasn’t HEALTHY. I was still eating piles of the SAD foods and compensating with hyper exercising. What inspired you to finally lose the weight and get healthy? CW: Health scare in my late 40s when I was diagnosed with pre-diabetes. I’d recently watched my father-in-law #2 die of the disease and had seen numerous friends, neighbors struggling to manage their insulin protocol etc. and knew I didn’t want to go there. And, how did you end up deciding to eat a plant-based diet? CW: My best friend suggested I read The China Study and explore becoming a Nutritarian (she too was struggling to find the real answer). I read The China Study and was so angry after learning what was being kept from us and how corrupt the “system” is…. I started reading more….. Eat to Live, Super Immunity, The Pleasure Trap and it snowballed from there. I dug around, read white papers/nutritional science literature, got my hands on as much information as I could and then decided I had nothing to lose and would give it a try. Being a data-driven person the science was irrefutable. Tell us a little bit about your journey, what were some of the challenges and inspirations you encountered when changing your diet? CW: In late summer 2011 I went cold turkey, following Dr. Fuhrman’s 6-week detox program. The science I read told me moderation/scaling back doesn’t work (we’re still putting toxic substances into our bodies), so the only way to truly break the cycle is to cut it off completely. It’s more unpleasant, but the duration if short vs. an ongoing battle of willpower and addiction. Initially, I didn’t tell anyone what I was doing because I wanted to prove to myself it worked first. My biggest challenge has been living in a SAD family. My husband is sedentary and obese. My extended family has numerous diet/lifestyle related health issues: My brother-in-law had triple bypass last summer (scheduled surgery, not emergency), father-in-law #1 died of alcoholism, father-in-law #2 type 2 diabetes and associated complications (his kidney’s failed), father-in-law #3 had a heart attack a couple of months ago, my father has CVD and stents, my stepmother is on a cocktail of drugs trying to manage rheumatoid arthritis. None of them want to hear that their diet/lifestyle is the cause, and refuse to even hear what I have to say, even though I’m living, visible proof it works! I tried getting my brother-in-law to adopt Dr. Esselstyn’s cardiac diet to avoid having a triple bypass, but he chose to have the surgery. I’m learning to leave them be (incredibly hard!) and understand that I AM NOT THE PROBLEM…….. but it’s gutting watching the people you love the most in this world slowly killing themselves and it’s all avoidable. How long did it take before you felt like it was second nature? CW: Once I was cleaned out (finished the 6-week detox) I felt so amazing, physically. I finally understood what it meant to be truly vibrant and to live in a body that was being properly nourished. I fizzed from the inside, I had energy galore, I felt like a million bucks all the time and most important of all, I didn’t need willpower anymore. It was so empowering to know I was finally in control. When I did go back and eat a SAD food my body rebelled (I felt awful), further validating how toxic those foods are. 6 years later and I’d say I’m 98%....(had some unintentional situations where I ate something and didn’t know it contained SAD foods). CW: Yes! It was his Eat to Live book that guided me through the transition. Technically I consider myself a nutritarian (once in a rare while I’ll eat a sushi-sized amount of fish, which is in the top section of his pyramid) but I’m predominantly WFPB and aim for organic whenever I can. I do NOT consider myself vegan because technically vegans will eat SAD foods, as long as they don’t contain animal products. Tell us a little about the fitness challenges you’ve set for yourself. CW: My triathlon days were over but I was still hungry for physical activity (I’ve never been known to sit still very well!). When I made the switch to WFPB life I started setting myself fitness challenges that didn’t involve any pounding (running). Something different each year to make it interesting and keep the body guessing. Long distance open water swimming. Long distance biking. I used to live in the PNW (near Seattle) so became an avid hiker up in the mountains. Beautiful! In 2013, I said let’s take that up a notch and train for a Grand Canyon Rim to Rim day-hike (24 miles, 10,000ft vertical). I finished it in 12 hrs 21 mins! Last year I took on the challenge of walking 1,000 miles. Reached the goal in October. This year I’m doing a quasi-Crossfit (my own regimen, not in a Crossfit gym) that requires me to complete various cross-fit style exercises 57 times (I turn 57 this year) and also includes being able to do a 5 min plank by the end of the year (major core work needed to get to that timeline…. I’m already up to 2m 15 secs). What advice or words of encouragement do you have for people who are on the fence about starting a plant-based diet? CW: You need to find your WHY…… your core reason / purpose for making the change. Only then will you stick with it. This becomes your internal compass. There are three key paths… pick the one that resonates with you: 1) Your body and your health are the most important things you own, so do it to ensure you live your best life possible. 2) If you have concerns about global warming/climate change then going plant-based will greatly contribute to reducing the impacts caused by animal-food industries). 3) If you love animals and are concerned about their well-being going plant-based will stop the abuse. I made the switch because of a health scare (option #1), but unintentionally ended up benefiting from the other two because I’m a planet-friendly person (my community service volunteering often helps non-profit orgs doing work to improve the environment etc) and love all animals (I’ve been known to rescue a mouse that was stuck behind a wall in our house and chewing on electrical wire and build him a little house outside so he could live out his life). I now feel fully grounded knowing I’m giving my body the best possible chance to let me live an optimal, vibrant life, I’m living more gently on the planet and I’m not contributing to the animal abuse that inherently goes with meat/egg production. What are your 2 favorite cooking tips for eating a PB diet that saves you times, money or prep? CW: 1. KEEP IT SIMPLE. 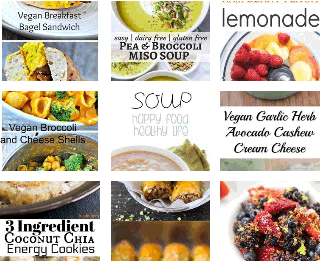 To start with, find 7 different plant-based breakfast, lunch and dinner recipes that you will truly enjoy and rotate those each week to keep you on track. Then explore the internet and other resources to slowly expand your food/meal repertoire! 2. LOOK AT WHAT YOU’RE GAINING, NOT WHAT YOU’RE GIVING UP. Don’t look for plant-based imitations of SAD food (it’s exhausting and they often taste bleah at best). Instead, embrace the wondrous plant-based foods that are out there and celebrate your new way of eating. Do you have a couple of go-to recipes that you love? CW: 1. BASE SALADS. 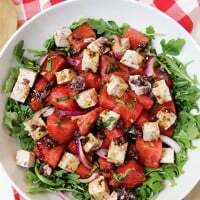 Bethany Stec Janicek (Love Chard Community: Whole Food, Plant-Based Nutritarian Lifestyle Support) has a salad challenge I recommend everyone take. Learn to build a base salad each week and then get creative with toppings. She offers the class for free, so sign up for her FB page and wait for the next one! Fuhrman promotes the need for us to eat 1 lb raw veggies (salad is the main dish) each day. Bethany’s program makes that fun and delicious! 2. HUMMUS: I make the following recipe once a week and have it on hand for all kinds of eats. Cook up ½ packet Goya dried chickpeas until tender (toss in three shakes of pepper flakes into the water before cooking). Put 4-5 artichoke hearts into the food processor. Add 3 tablespoons lemon juice, freshly ground black pepper. Toss in the cooked chickpeas, turn on the processor and add just enough of the aguafava (bean juice from cooking the chickpeas) to make it form a dip like consistency. This is absolutely delicious still warm on top of some steamed greens/tomatoes. Can schmeer it on WW bread. I make a collard sandwich (two fresh, crisp collard leaves with hummus in between). Put a warm dollop on a salad for a contrast in textures/temps. Use as a dip with veggies. 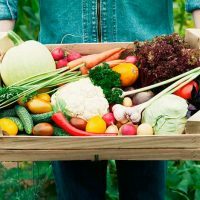 CW: I firmly believe the WFPB movement is growing and the tipping point is coming. Similar to the tobacco scandals of the 80s, we’re now in the early stages of revealing the food/nutrition/cancer scandals. The word is getting out. The science is solid and cannot be ignored, it’s just a matter of time. I’m a big believer in life-long learning (recently earned eCornell’s certificate in Plant-Based Nutrition) and I’d like to take that further and become a health coach. I'm exploring what programs out there I can take to get me there. Any recommendations? I’ll continue to live by example and love my family unconditionally and if/when they want to reach out for help and support I’ll be there to guide them every step of the way. I’m active on a number of plant-based FB pages and offer my thoughts, support, and inspiration when I feel it helps. I’ve been private messaged a number of times for private help/support, so that validates I’d be good at doing this type of thing! I’m studying ASL and hope to become an interpreter someday (I’m asymmetrically deaf). Sharing this information more deeply with the deaf community would be inspiring. I’ve been in conversations with leaders of the Ethical Choices Program about possibly becoming one of their trainers. I hope you enjoyed this plant-based success story. 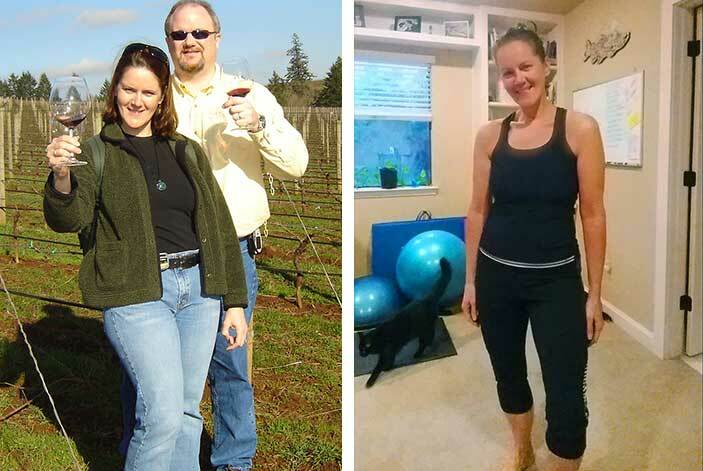 I'd love to hear from you and how eating a plant-based diet changed your life. 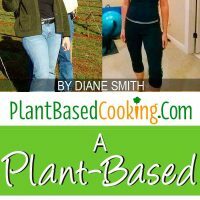 If you'd like to share your plant-based success story with Diane at Plant-Based Cooking, send her a note, diane@plantbasedcooking.com. Thanks for sharing this interview. I know Eat to Live but not Plant Pure Nation. Watching the documentary now. Awesome information. Hope to inspire my husband to move to plant based. He has RA and can’t walk without crutches. Thanks Theresa. Glad you found the Plant Pure Nation documentary. 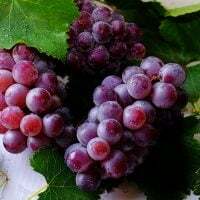 Hope you enjoy it and that both you and your husband find health and enjoy the recipes. You are an inspiration and I’m 100% with you, I want to become “plant based” certified and become a health coach! 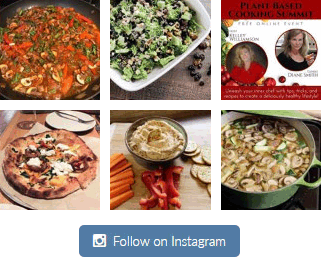 Love your website here lots of good information and recipes. Glad you enjoyed Carol’s story and thanks for the positive feedback… very much appreciated. ??? ?